This year, the Ospreys Supporters Club will be donating proceeds from OSC pin badge sales to Paul’s nominated testimonial charities. Paul has decided to support the Mind Charity as part of his Testimonial activities as mental health is something that is of great importance to him. Although there has been an increase in media exposure of the topic of late, he still feels that the level of public support and understanding of mental health has a long way to go. Mind provides advice and support to empower anyone experiencing a mental health problem. They can campaign to improve services, raise awareness and promote understanding. In addition to Mind, Paul will also be supporting charities local to where his events are held during the year. 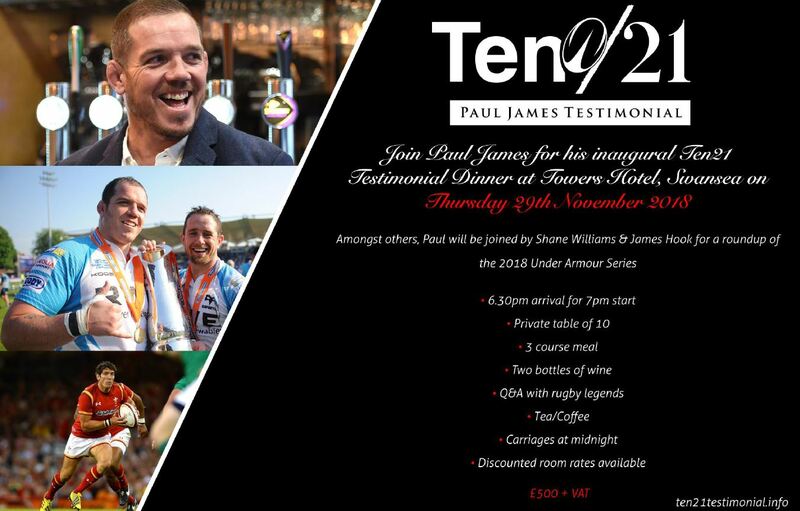 As part of Paul’s testimonial year, there will be a dinner at the Towers Hotel on 29th November with guests including Ospreys legends Shane Williams & James Hook. 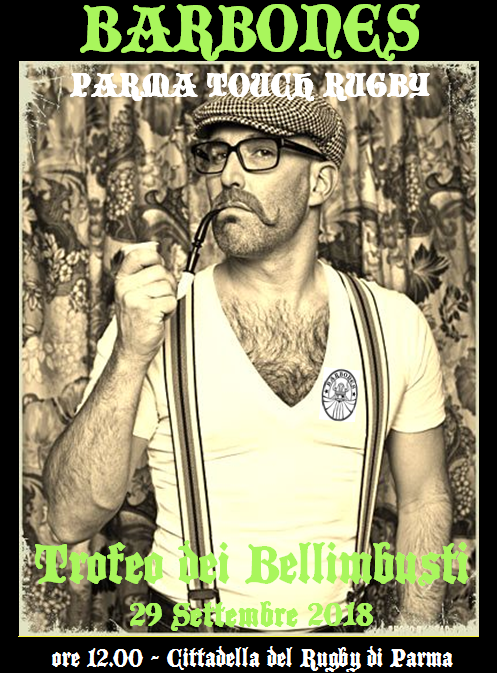 Zebre Away Event – Touch Rugby! We have had a FANTASTICO offer from our friends in Zebre! 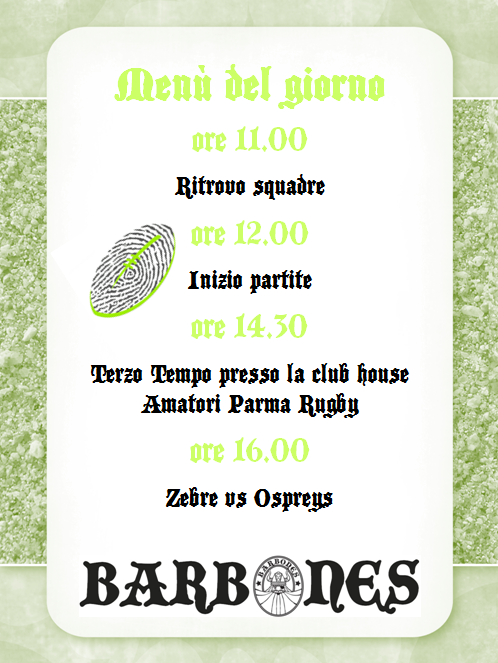 Hi, I woulk like to invite Ospreys supporters to play a Touch Rugby OLD tournament in Parma at 12:00PM before Pro14 match vs Zebre. Bring only rugby shoes with you, we’ll take care of the rest. Let me know by Sunday23; I will send you all the details. We will wait for you on 29th; also just for a beer. Keep in mind that this is a friendly tournament that we will play especially to spend a good third time together and then go to the stadium (two steps true). 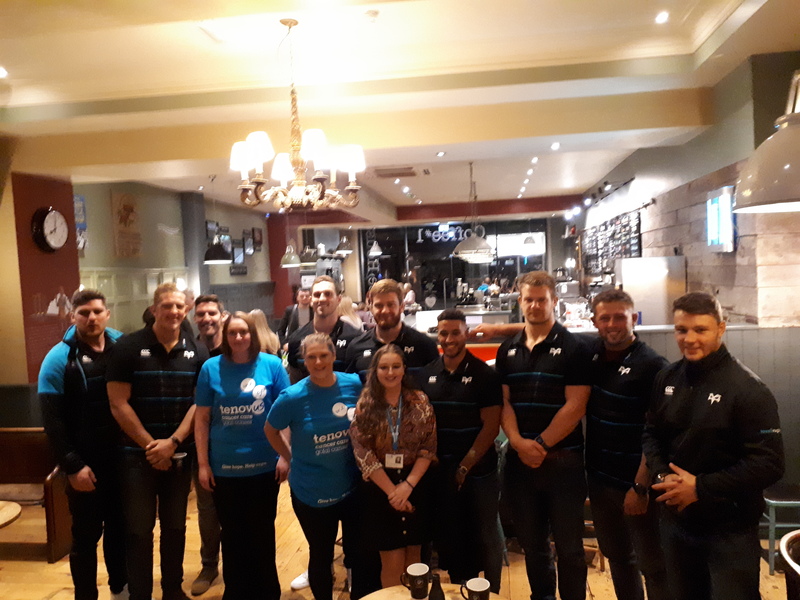 It was great to see few familiar faces including OSC memebers, Ospreys & OitC staff as well as players turn up at Coffee #1 in Swansea to support the Ospreys quiz night raising money for their official 2018/19 charity partners OitC and Tenovus. Tenovus who’s motto is ‘Give hope. Help cope’, bring invaluable support, advice and treatment to cancer patients within local communities with Ospreys in the Community supporting people of all ages across the region in areas such as sport, education, health and inclusion. Players were moved around the teams from round to round (“how are we supposed to win if we move teams?”) and it was great to see their varying contributions. It’s fair to say that James Hook made a positive contribution to our team and its entirely fair to say it was a lot more than any of the other players managed! If you want George North on your team for any round, its definitely not the Ospreys trivia round (“I’ve only played two games!”) – and to finish off, Will Jones might have seen a fair bit of the world on his Judo travels, but he can’t find any of them on a map. 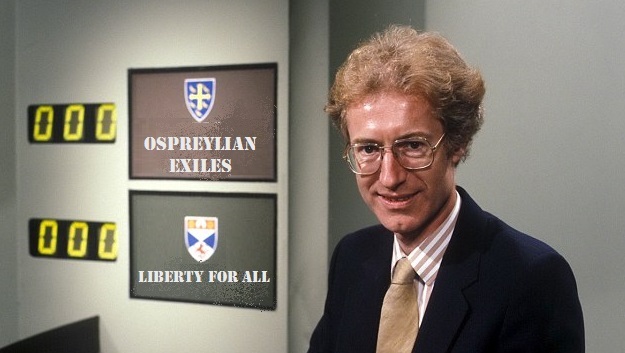 After the success of tonight’s event, expect to see further charity quiz evenings organised by the Ospreys and OitC as well as more OSC quiz evenings. We will be holding our annual pre-season Q&A at The Pavilion, Llandarcy on Tuesday 28th August at 7pm. Matt Sherratt, our new backs coach will be there together with our new squad members Scott Williams, Luke Morgan and Aled Davies. Entry is £2 on the door but places MUST be pre-booked due to limited spaces. It would be fantastic if lots of you could support our event for a true Ospreys legend! 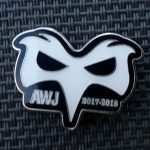 We’ve organised this so all Ospreys supporters get the opportunity to be part of Alun Wyn’s tesimonial year (as well as through your fanatastic support buying this year’s OSC badges where all proceeds will go to the three charities AWJ is supporting). Entry is free of charge but a contribution to AWJ’s charities would be greatly appreciated. There will be special guests supporting AWJ – these havent’ been confirmed yet but from the names we’ve heard being suggested, its an opportunity not to be missed! For further information on Alyn Wyn’s Testiminial Year, cick here. 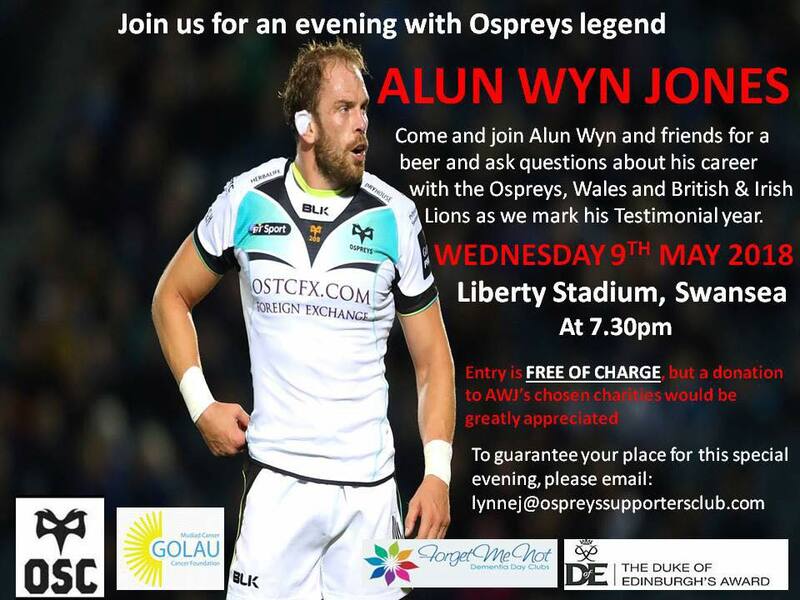 Please email lynnej@ospreyssupportersclub.com to guarantee your place at this special event. The OSC will be holding a curry and quiz night at The Pavilion in Llandarcy on Wednesday 14th March at 7.00pm. Tickets are just £5.00 per person and will be on sale from tomorrow evening in the Riverside. We hope to see plenty of you there to pit your wits against each other! We are delighted to be hosting (at short notice) the second Q&A of this season at the Liberty Stadium. This is your chance to ask all your burning questions to those at the helm! For those unable to attend, please email sarah@ospreyssupportersclub.com with your questions. Priority will be given to those in attendance but we will make every effort to ask questions send in as time allows. There is free parking at the stadium and the bar will be open. There is a nominal cost of £1 and all proceeds will go to Alun Wyn Jones’ Testimonial Charities fund (OSC/AWJ badges will be on sale at the event if you haven’t alreasdy got one. Tickets will be on sale this Sunday pre & post match in the Riverside Bar and also pre match in the 2003 Lounge. Roger Blyth took on the role of Chairman of Ospreys Rugby in 2013. Roger has had a distinguished career in both business and Sport representing Swansea RFC and Wales on no less than 393 and 6 appearances respectively. Andrew Millward was appointed Managing Director in 2016. Andrew represented Neath RFC more than 100 times before the formation of the Ospreys, going on to play 94 times for the region before hanging up his boots in 2009 and moving into the management team. Steve Tandy made his Neath debut in 1998 and went on to play 102 times for the Ospreys. Steve took over as head coach at the Ospreys in 2012 after spending the previous 2 seasons as head coach of Bridgend RFC. Huw Warren joined Ospreys Rugby from Bath RFC in 2016 as Head of Commercial. Huw drives commercial strategy and is responsible for all commercial activities at Ospreys Rugby. The OSC AGM will take place on Monday 25th September at 6pm at the Liberty Stadium. All season ticket holders (mambers of the OSC) are welcome to attend.